6th March 2012. 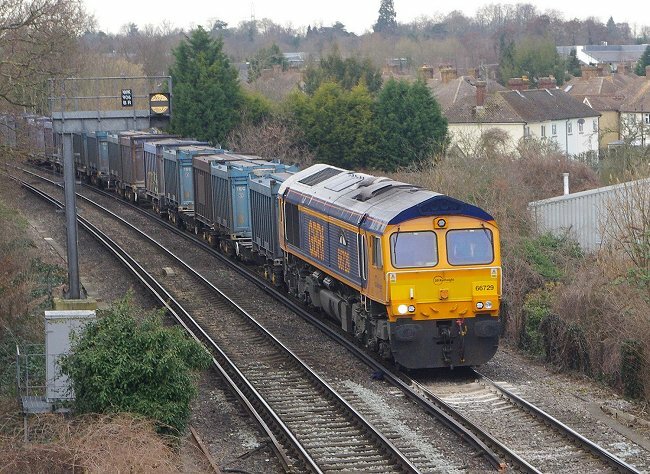 GBRf class 66 number 66729 hauls train 4Y19 empty gypsum containers from Mountfield to Eastleigh past Coxes Mill. 5th March 2012. 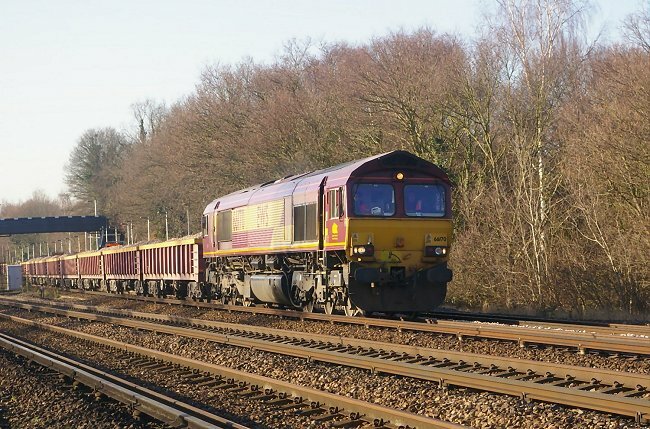 GBRf class 66 number 66722 in Metronet livery hauls train 4Y19 empty gypsum containers from Mountfield to Eastleigh past Coxes Mill. 3rd March 2012. 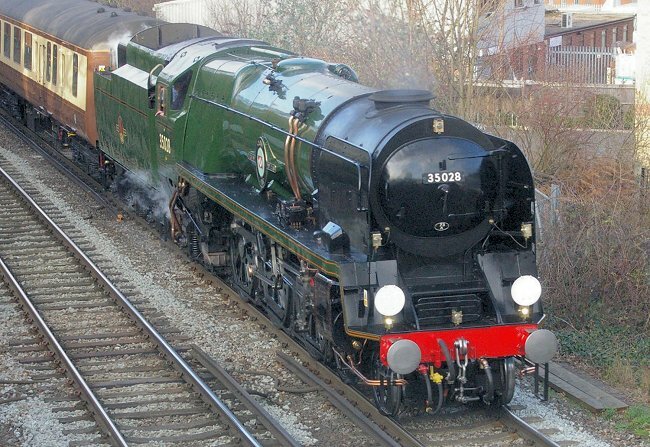 Merchant Navy class locomotive 35028 'Clan Line' heads train 1Z82, a VSOE luncheon circular tour, as it passes Coxes Mill at Addlestone on the London Victoria to Shalford leg of the tour. On this day the locomotive carried the 'Golden Arrow' headboard and smoke deflector arrows. 21st February 2012. 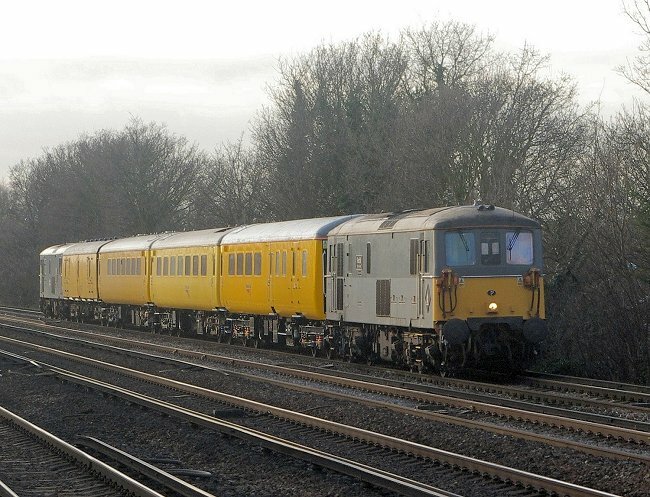 Class 73 electro-diesel 73138 heads test train 1Q60 from Portsmouth to Wimbledon through Esher. Sister locomotive 73107 in grey livery is at the rear of the train. 21st February 2012. 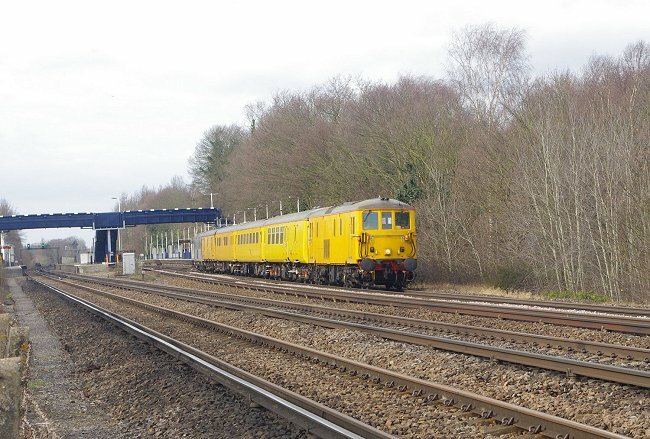 Class 57 diesel-electric locomotive 57312 heads a snow clearance train with sister locomotive 57 303 on the rear as it passes Coxes Mill in Addlestone with train 5Z69 from Tonbridge to Eastleigh. Again the poor February light has resulted in a poor photo. 20th February 2012. 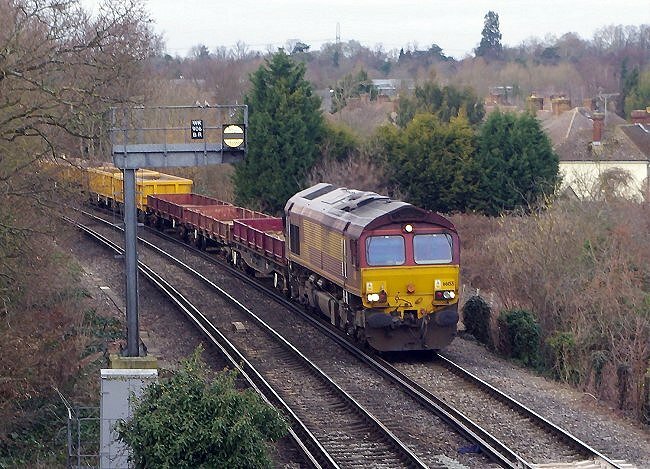 DBS class 66 diesel-electric locomotive 66155 in EWS livery heads past Coxes Mill in Addlestone with train 6Y42 from Hoo Junction to Eastleigh in poor light. 17th February 2012. 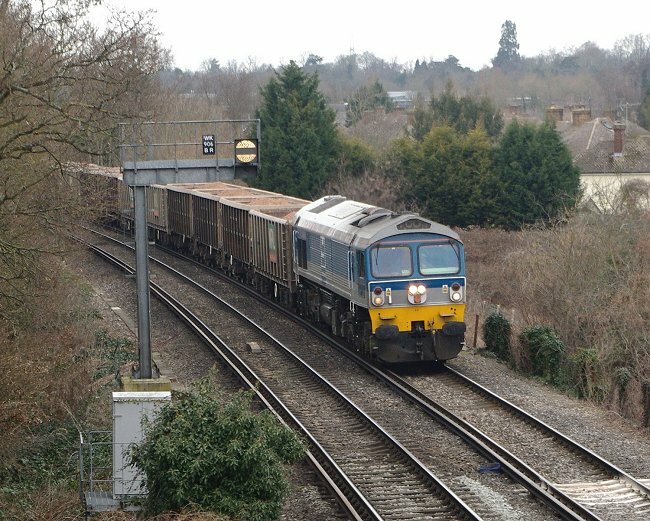 Foster Yeoman class 59 diesel-electric locomotive 59002 heads past Coxes Mill in Addlestone with train 7O04 from Acton Yard to Woking Stone Terminal. 15th February 2012. 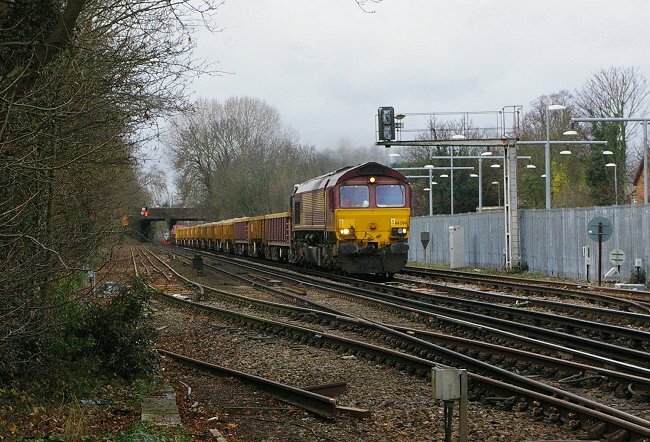 Hanson class 59 diesel-electric locomotive 59101 heads past Coxes Mill in Addlestone with train 7O04 from Acton Yard to Woking Stone Terminal. 14th January 2012. 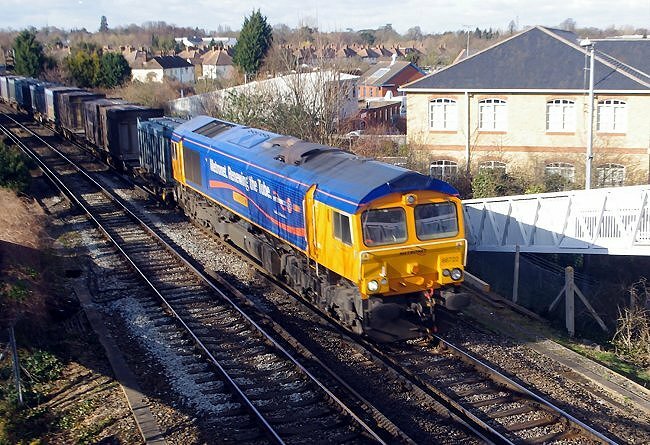 DBS class 66 diesel-electric locomotive 66170 heads through Esher at the head of engineering materials train 6N05 from Eastleigh to New Malden. 9th January 2012. 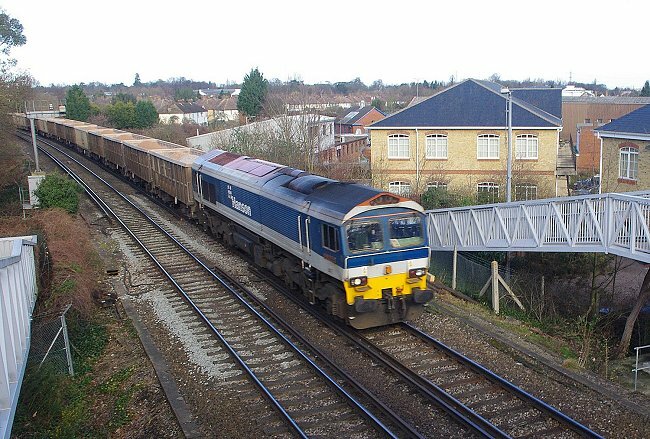 Class 73 electro-diesel locomotive 73107 in grey livery approaches Hersham station on the Up Slow line with test train 1Q38 from Portsmouth to Hither Green. 7th January 2012. 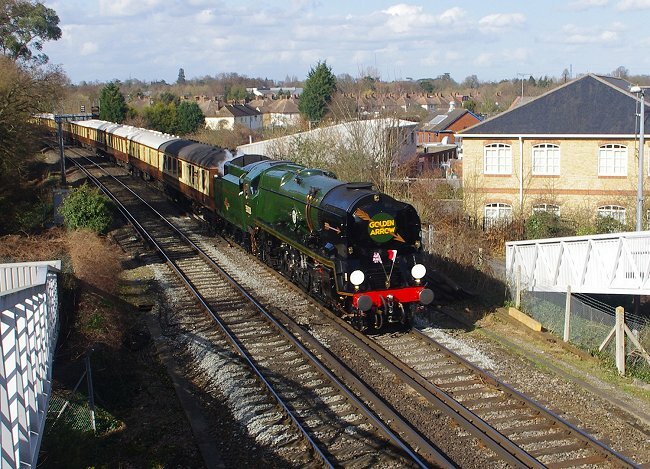 Merchant Navy class steam locomotive 35028 'Clan Line' heads past Coxes Mill at Addlestone with VSOE circular dining tour 1Z82 on the London Victoria to Shalford leg of its journey. 1st January 2012. 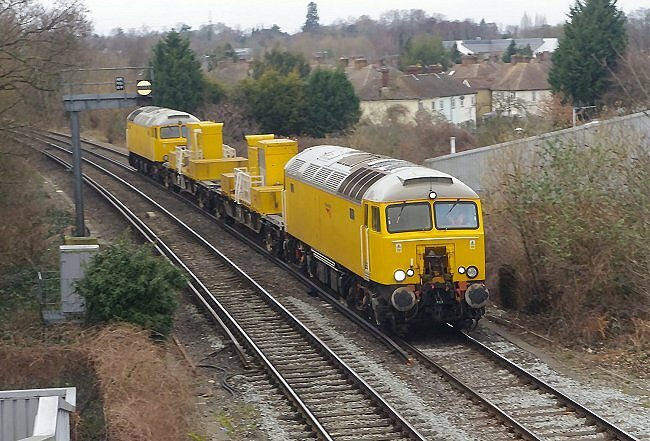 DBS class 66 diesel-electric locomotive 66200 heads past Staines Goods Loops with engineering materials train 6N02 from Eastleigh to Barnes.